I got another change today, the Sydney driver is sick of the city, and so today I got to go to the city instead. I had found everything but one box and thought ok I might just jump in the back of a few trailers and see what I can find. As I got out of the back of one and was walking away I felt a drip and thought whats this. 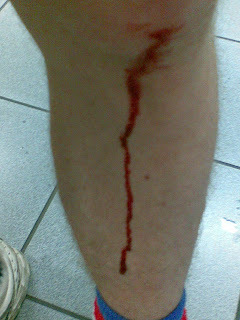 There was a gush of blood sliding down my leg. I thought perhaps I better see what I've done here and go find myself a bandaid. The first aid room was close to the office and I soon found what I needed and headed for the toilets. After a few minutes of towelling off, I was able to get it to a trickle and patch it up. The boss goes someone will try anything to get out of work, no sympathy there, another guy just goes to me and you didn't find the box either. Oh i am jealous! You shouldn't torture me putting pictures of that on there, they are my FAVOURITE! 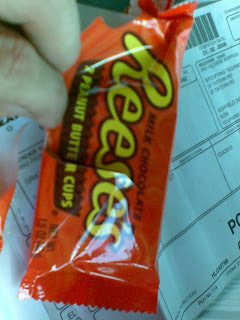 Out of all American lollies my favourite is the Pea nut butter cups and Reeces peanut M&M's. Chrish!!! You mean we came to Sydney and you knew a place where they sold Peanut Butter cups and you didn't take us there!?!?!?!??!?!!? I would have been more excited about peanut butter cups than Krispy Kreme's! Is that Sugar Fix shop at Miranda Westfield? We have been there a few times when we have stayed with Georgina and Damien. Yep the store is sugarfix down in westfield Miranda. I get down that way a little, so I try and pop in for a fix when I can.